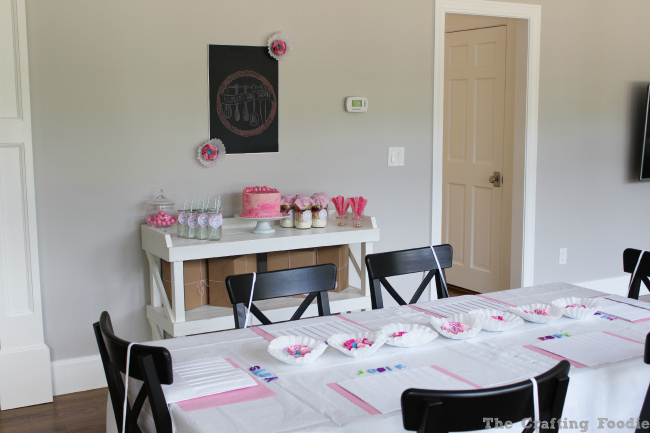 A few weeks ago we celebrated my daughter’s birthday with this Bake Shoppe Birthday Party.
. While I almost had the entire party planned out way ahead of time, I was still sort of stumped about the cake. Yeah. I know. You’d think as much as I bake, I would have the cake figured out right away. But, nope. I sort of procrastinated on that one, minor detail. Then a few days before her birthday party, I came across this post from Created By Diane. 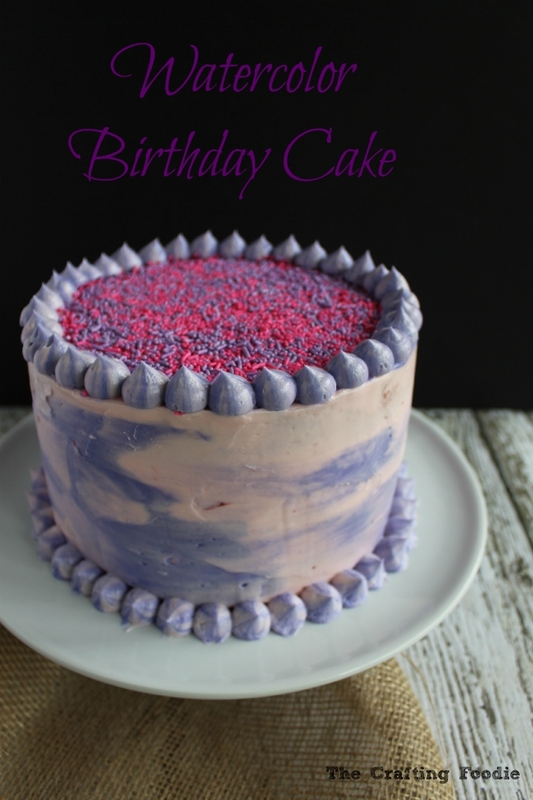 I decided to use a similar technique to make this Watercolor Birthday Cake. For my daughter’s party, I used two shades of pink, but for this cake I used a light pink and purple. First, just like any cake, I crumb coated the cake with the light pink frosting because light pink is what I chose as the main color for the cake. Personally, I love how a crumb coated cake looks. It has that minimal, rustic look. But I’m pretty sure that the little girl who I made the cake for, would definitely not appreciate it. Once it’s crumb coated, I slathered on a thick, final layer of the pink frosting. Before smoothing it out, I put large blobs (yes, blobs, that’s the technical term I like to use) of purple frosting all around the sides and the top of the cake. I have to admit that I always panic at this stage. I immediately doubt it’ll turn out and regret the big blobs. But it works out. Always. Trust me. 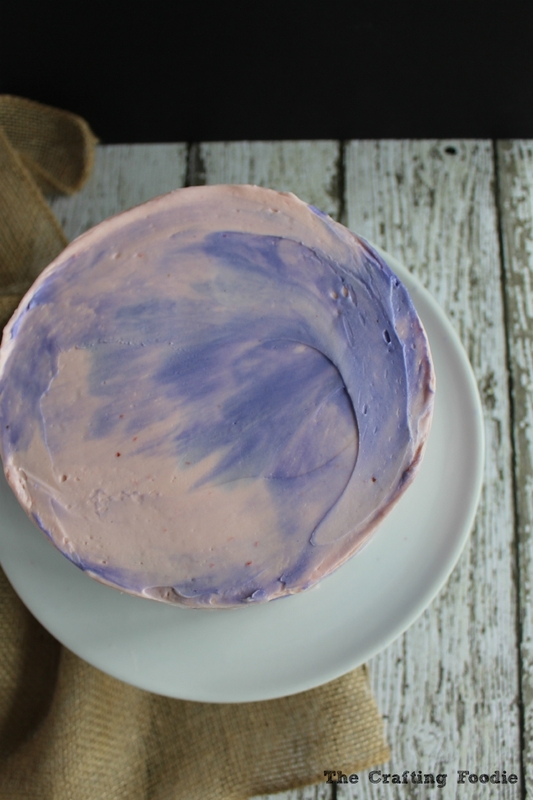 Once you smooth out the cake, you get this beautiful watercolor effect! I LOVE how the top of the cake turned out, but the birthday girl specifically asked for a lot of sprinkles. 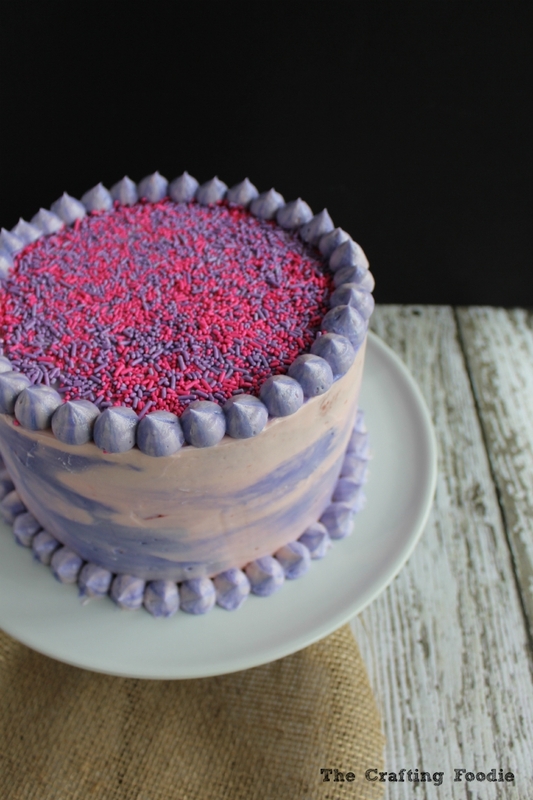 So, I doused the top of the cake with pink and purple sprinkles. For the final touches, I placed all of the pink and purple frosting in a bowl. I just barley mixed them, and then spooned both frosting colors into a single piping bag fitted with a large round tip. Using the two-toned frosting, I created a boarder around the base of the cake and the top of the cake. The birthday girl was so happy with her Watercolor Birthday Cake, and so was I. I can’t wait to figure out how I can use this same technique on as many cakes as possible! Grease and line three 8-inch circle pans with parchment paper. In the bowl of an electric mixer fitted with a paddle attachment, beat the butter until soft and fluffy. (about 1 to 2 minutes). Add 1½ cups of granulated sugar, and beat until fluffy (about 5 minutes). Add the egg yolks, one at a time. Beat until just combined. With the mixer on low, add the flour mixture and milk in three additions, beginning and ending with the flour mixture. Transfer the batter into a large mixing bowl. Clean the bowl thoroughly. In the bowl of a mixer fitted with a whisk attachment, beat the egg whites until foamy. Once soft peaks form, slowly add the ½ cup sugar. Continue to beat until stiff peaks form and the egg whites are glossy and white. Fold the egg whites into the batter using a rubber spatula. Mix until just combined. If you over mix the batter, it will deflate. Bake for about 25 min or until a toothpick inserted in the center of the cake comes out with a few crumbs attached. Allow the cakes to cool for about 15 minutes in the pans. Then turn the cakes out onto cooling racks and allow them to cool to room temperature. While the cakes cool, make the frosting. In the bowl of a mixer fitted with a paddle attachment, beat the butter until fluffy. With the mixer on low, add the confectioner's sugar. Mix until combined. Add the cream and increase the speed on the mixer to medium, and beat until fluffy. 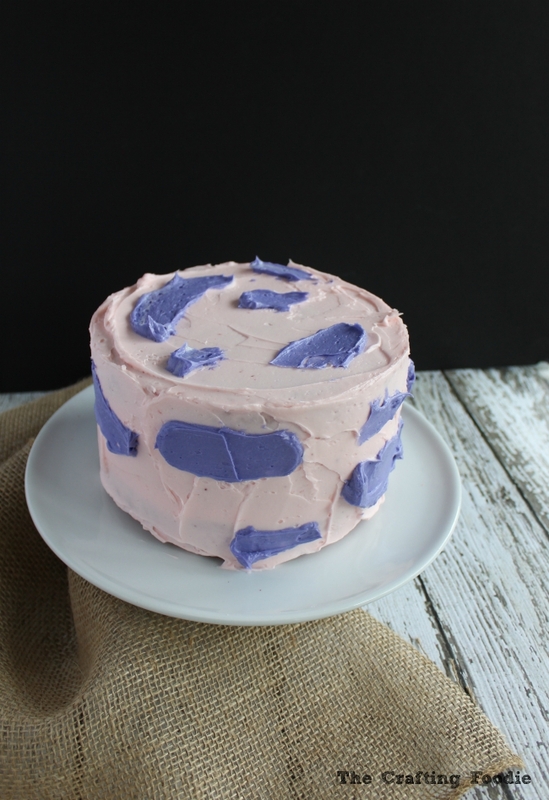 Remove ⅓ of the frosting, and tint it with the purple food color. Tint the remaining frosting with the pink gel food color. Level each of the cakes so that the tops are flat. 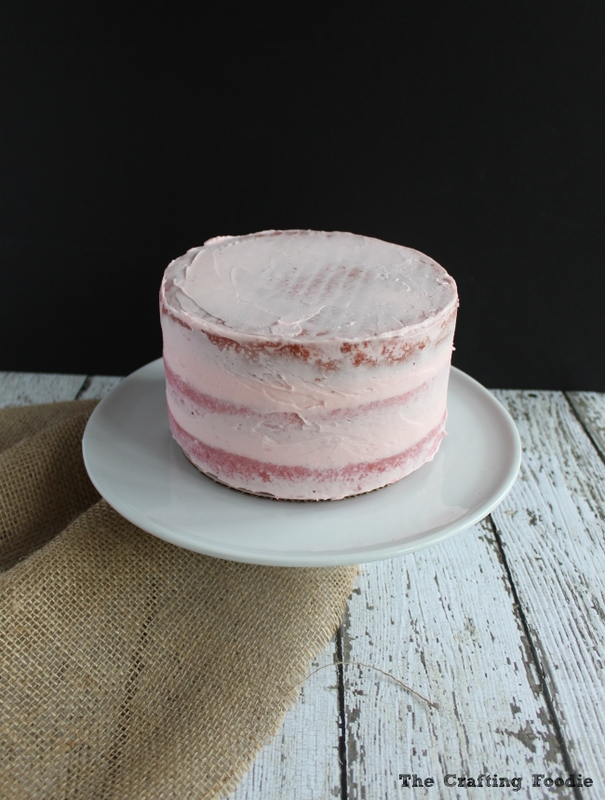 Place the first layer on a cake board, and place a scant ¼ cup of pink frosting on top of the cake. Spread to an even layer. Place another cake on top. Repeat the frosting process for the second layer. Add the last layer on top. Chill the cake in the fridge for about 15 to 20 min. Once the cake is chilled, using the pink frosting, crumb coat the cake. This means, spread a thing layer of frosting over the exterior of the cake. This locks in the cake crumbs. Preventing them from getting mixed into the final layer of frosting. Chill the cake for about 20 min. Add a thick layer of the pink frosting. Don't bother smoothing it out. 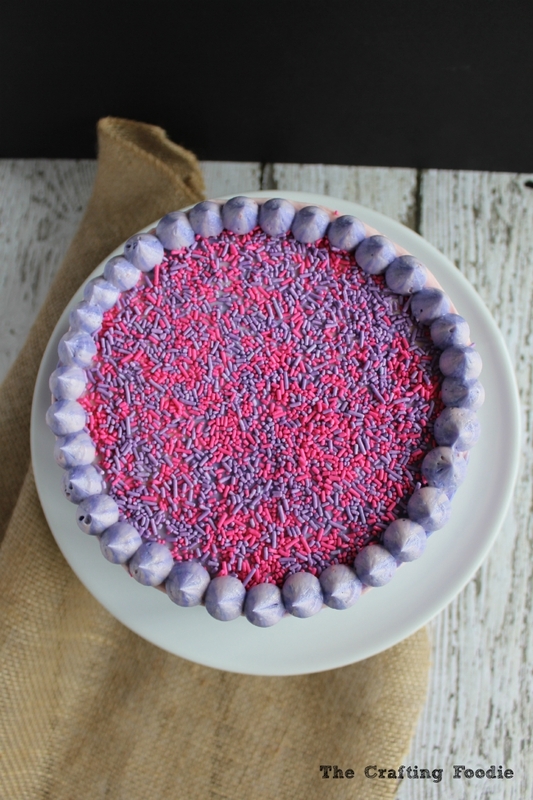 Place large blobs of purple frosting in random areas of the top and sides of the cake. Using a clean, off set spatula, smooth out the frosting. Wiping access frosting off of the spatula as you go. With the extra frosting, place the pink and purple frosting in a bowl. Mix the frosting together in one or two strokes. You want to see the different colors in the frosting. If you over mix it, the frosting will be a single tone. Using a piping bag fitted with a large round tip, pipe around the base of the cake and the top of the cake. Fill the center of the cake with sprinkles. What a fun cake!! Love, love, love that watercolored look! Thanks so much Sharon! The possibilities with this easy technique are endless! Wow! Aida! Love the watercolor concept! Where was this cake last week for my B-day?! 🙂 Next year for sure! Thanks for sharing! Happy Birthday Tonya!!! I hope you had a wonderful day 🙂 This cake has to make an appearance next year – for sure! This is gorgeous and so simple! Pinning! Thanks so much, Julie! I know – it’s so simple but still so pretty. That’s my kind a cake! Gorgeous! Great choice! I’m sure she loved it. This cake turned out really pretty! as beautiful as that all is, the jimmies are my favorite part. oh..jimmies are philadelphia speak for sprinkles, lol. Thanks so much! Yup – in the midwest (where I’m originally from), we also call them jimmies 🙂 That’s always the favorite part for my kids, too! Fun and pretty! Thanks so much for sharing with us at the Inspire Me Mondays Link-Up! This is such a beautiful cake, Aida! Hope your daughter had an amazing birthday! I’m sure she was over the moon about this cake! Love the pretty colors! Thanks so much, Kelly! She loves vanilla cake, so the more exciting I can make the cake the better. She loved it!